Cheap Thrills: Only a Buck! Have you visited your OB-GYN lately?Ugh! I did. McDonald's McRib Launch ShindigFab Chick Worthy? The holiday season is here, giving us a reason to sparkle a little more. Limited edition colours "Take A Chill Pill" and "Big Daddy Cane" are perfect for holiday parties, giving guests something too admire while holding your champagne glasses. The other two added colours, "Take It Or Leave It" and "Who's The Boss" are also fab, fun colours for this winter season. As if we really need a reason or season to have fun nails. And get this. 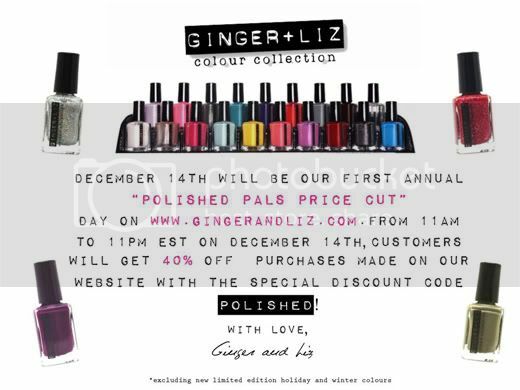 December 14th Ginger+Liz will have their first annual "Polished Pals Price Cut" day on www.gingerandliz.com. From 11am to 11pm EST, all you fab chickies will get 40% OFF your purchases. Just remember to use special discount code "POLISHED". So add this to your calenders! Talk about fab chick approved stocking stuffers. Don't worry, my holiday gift guide is on it's way. In the meantime, make sure to head over to Ginger+Liz.com to Pre-Order the new colors NOW! 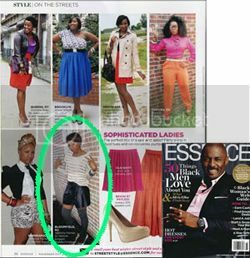 You all should know by now, I've deemed the brand fab chick approved. The shades (and names) are too cute. Thanks for passing the promo code along. I've never tried Ginger + Liz, I need to change that asap! Being the nail aficionado that I am, I've been meaning to try this line for a while now. I guess I'll rack up on some colors during that sale.